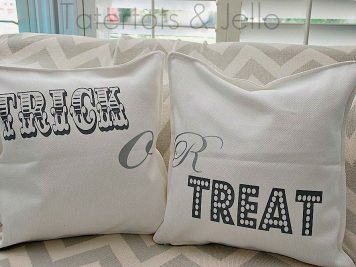 Chic Halloween Decorations – Tricks & Treats! 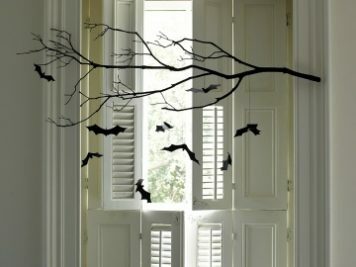 With Halloween creeping up on the horizon, it’s about time to get into the spirit of the season (all puns fully intended. Sorry). 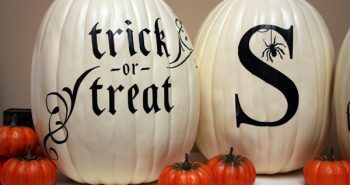 Whether you’re in the midst seeking Halloween decorations for your party planning or simply adding some fun Autumn decor to your place, you might be feeling a bit overcome by the amount of kiddie style tat in the shopping aisles! 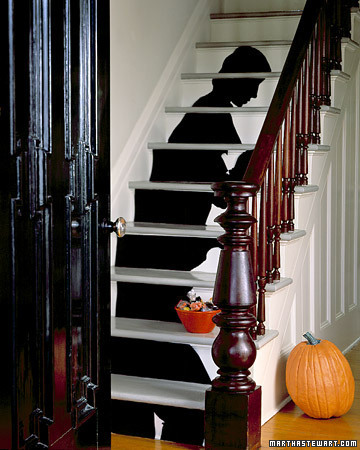 Now, subtle sophistication and happy Halloween don’t always go hand in claw I know. 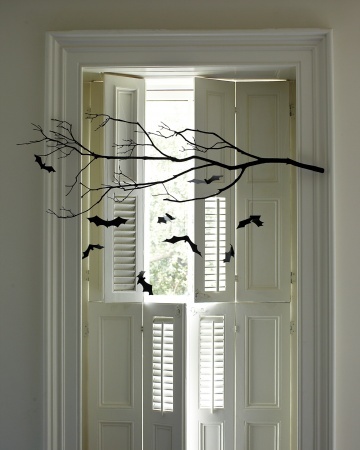 However, when an adult spooky soiree just does not call for googly-eyed ghosts wrapped in tinsel or colourful cartoon coffins, what exactly DO you decorate with? Like any good little witch, I’ve worked my magic. 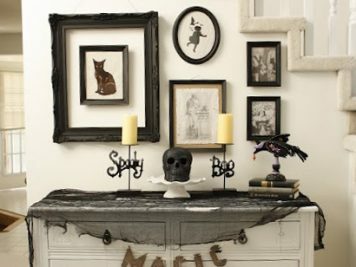 I’ve mixed together a spell of ideas on how to conjure a haunting décor with a dash of class (no newts lost their eyes and no bat wings were removed in this process. I am a vegetarian witch). 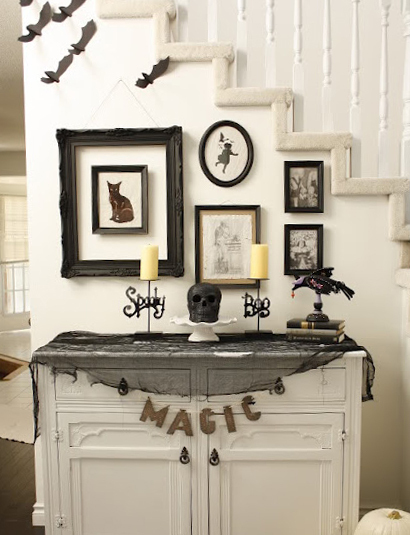 Monochrome elegance is always a solid option when it comes to creating a smart look, and Halloween lends itself to this palette perfectly. 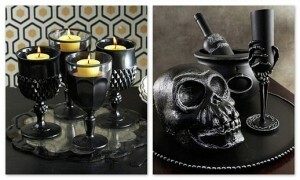 You simply cannot overdo the black colourway when it comes to arrangements of cauldrons and gothic candlesticks. 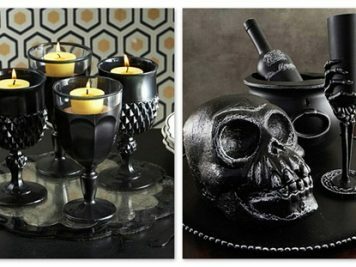 Try spray-painting your old collection of tacky tidbits for a more uniform look, like this display of cheap plastic skulls and Halloween goblets that have been piled onto a tray to make a cohesive display. 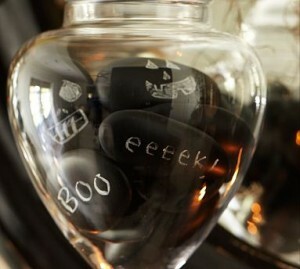 This rock collection has been sprayed in chalkboard paint and scribbled with ominous messages and ghoulish faces. 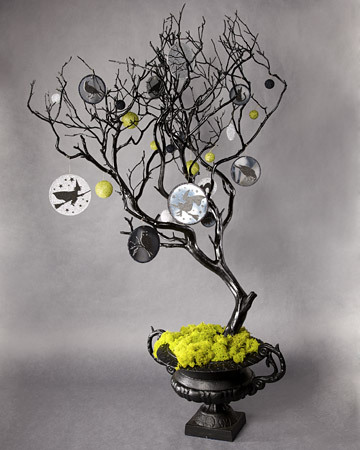 The decorated pebbles are then casually arranged in a glass bell jar with the artwork facing outward on display. 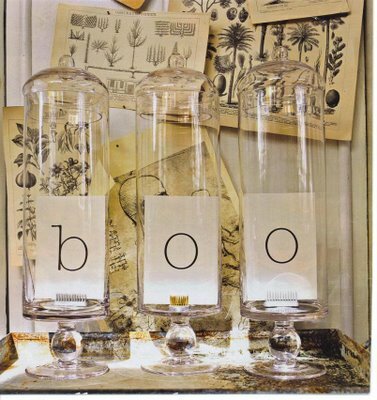 For some reason, everything seems to look better in a glass bell jar for Halloween… Think abandoned mad scientists laboratory. 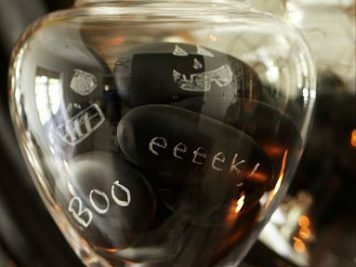 Glass vessels present lots of entertaining possibilities for a Halloween display. 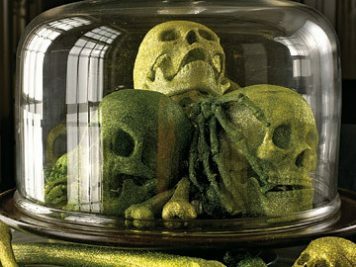 They can be packed with mysterious ‘specimens’ and your very own potions: fill clear bottles and mason jars with water and food colouring for a murky veil in which to suspend brains (cauliflower) and eyeballs (grapes), and finish them off with bewitching labels describing their creepy contents. It doesn’t matter if you’re not particularly arty when it come to creating the labels for your bottles and jars. Hand scribbled labels only add to the authenticity. Use a black fineliner pen on a plain white or cream paper to scratch out your witchiest/maniacal scientist’s handwriting. You can easily add a bit of age to your paper by staining it with a wet teabag–the messier and more uneven the stain the better. 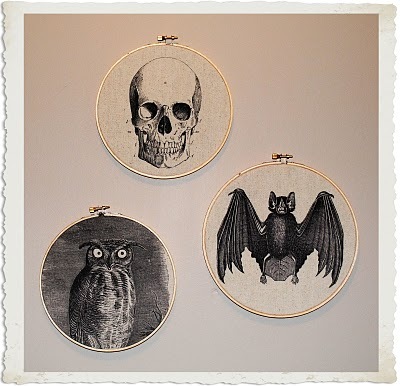 Finish by doodling a curly border or freehand a wonky frame for extra eye-catching effect. 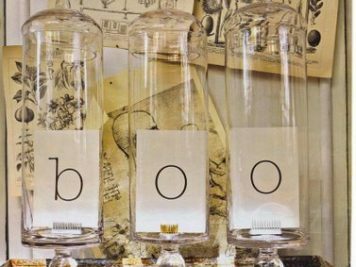 In the past I have used all sorts of glass containers to create my table displays–even a spaghetti jar and a cake stand do the trick! 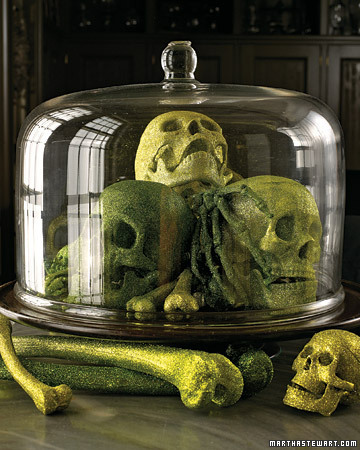 (Not used for a Halloween cake or some kind of spooky spaghetti I might add). Don’t limit yourself to decorating these only at Halloween either. 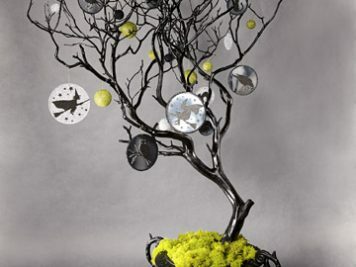 You can fill them with shiny baubles at Christmastime and decorative eggs at Easter. Halloween candle holders that have been wrapped with tracing paper prints allow the flickering light to shine through the design as the wax burns down. 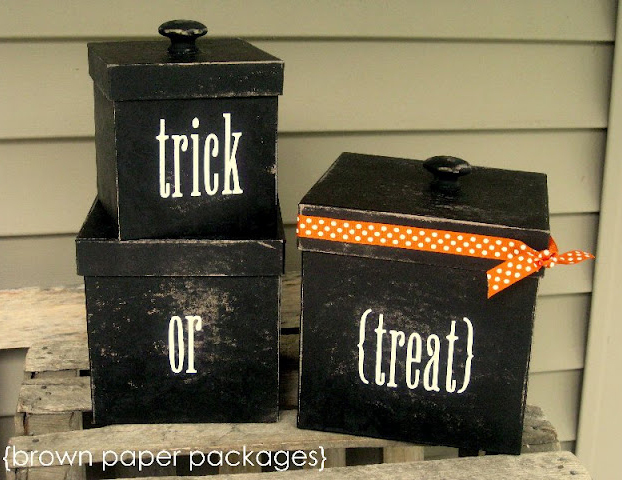 You can print these yourself at home using translucent paper stock that is recommended for your printer. 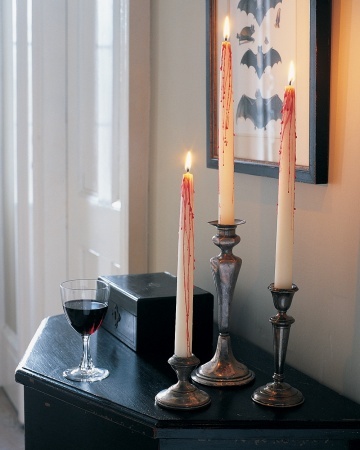 Do be careful to keep any paper well clear of a naked flame, and never leave burning candles unattended. 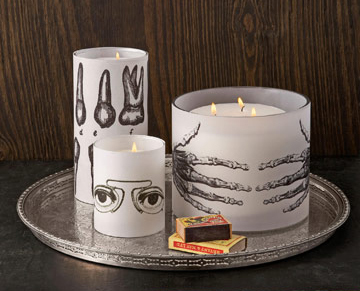 Battery-operated tea lights and realistic LED flickering candles are an excellent safer alternative. 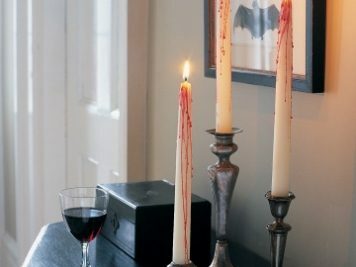 Alternatively, you could melt and drip red wax over tall white candlesticks for a bloody effect on a Halloween table centrepiece. 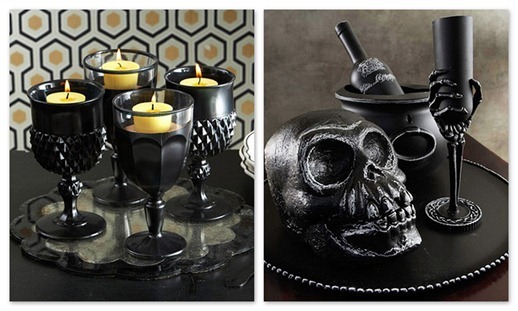 An ideal mix of horror and sophistication for a vampish dinner party. 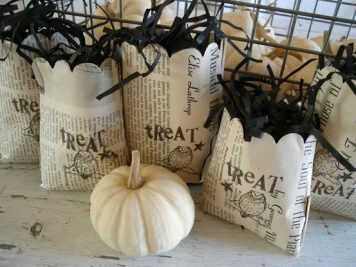 When you want to fill up a Halloween party decor scheme, the best pumpkin designs are those that require minimal time and effort like these Perfect Pumpkins – Good for Those Who Don’t Care to Carve. 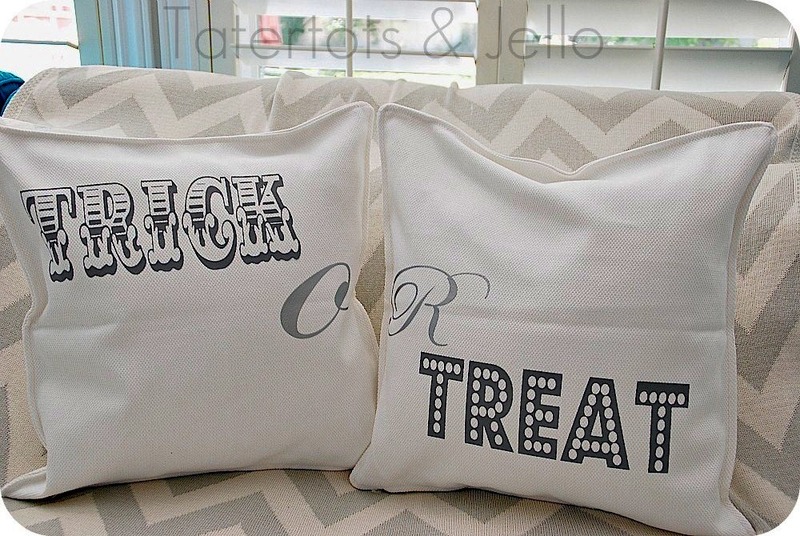 Lace covered and spray painted pumpkins are a great lazy option. 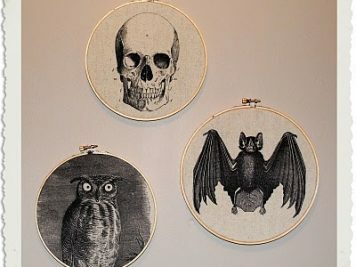 Designs made out of drill holes can also create effective back-lit patterns with little to no artistic ability. 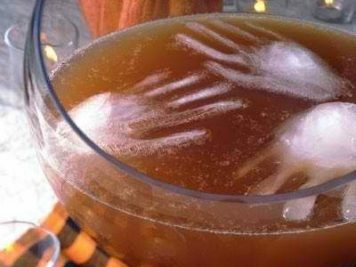 Don’t forget to add a touch of Halloween to the drinks you’re serving too. 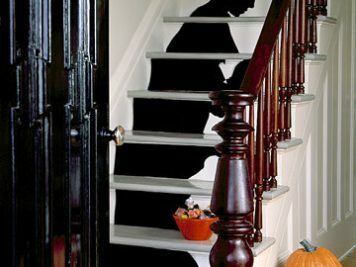 If you don’t want to invest in Halloween ice-cube mold trays then how about some cheap and disposable spine-chilling punch coolers? Get a bunch of disposable gloves, fill with water and pop them in the deep freeze. Voila! 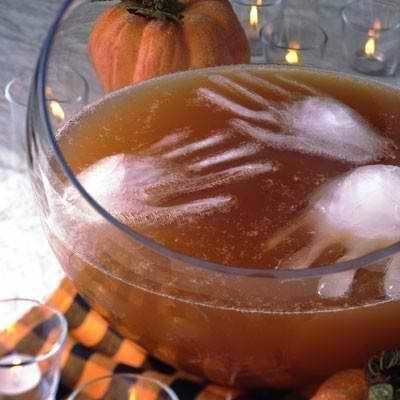 Severed hands floating in your punch bowl. Love all of the ideas provided! 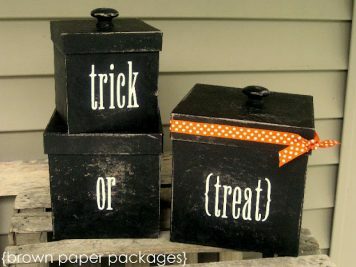 Very spooky with a touch of Halloween class!! !